As I mentioned in my last post, I bought an air fryer on sale. What is an air fryer, you ask? Well, it’s basically a healthier version of a deep fryer. It fries food with hot air instead of oil. Personally, I am still figuring out what works and doesn’t work with it and trying to perfect temperatures and cooking times. I have found that using a lot of liquid batter without any kind of dry coating over it does not work so well. It says you can make donuts in it, but I have no clue how that’d work. I have not tried cooking french fries yet, but I really want to, just haven’t yet. So far I have fried some soy curls using this recipe here. Those came out excellent, I think I cooked them at 350 for about 10 minutes. I also tried defrosting some Gardein chicken scallopini, coating it in watered down Neat egg substitute coated with vegan/gluten free rice crispy-esque cereal. That was okay, but not that exciting even though I had high hopes. Combine flour, cornstarch, baking powder, and salt in a medium-sized mixing bowl. Whisk in the water, vodka/soda water until a liquid, medium thickness batter forms. Water it down if necessary to be the desired thickness, but it should stay fairly thick. Cut tofu into smallish rectangles. Place some of the sweetened coconut into a dish. Dip the tofu in the batter, then into the coconut. Delicately place in the air fryer tray. Air fry for 10 minutes, 350 degrees F or slightly lower if you don’t want it as browned as I did. May take some experimentation as I believe air fryers can vary quite a bit. Use sweet chili sauce to dip in, and serve with a generous helping of veggies! I’m sure I’ll discover some new tips and tricks about air fryers soon! So check back here for those. Until then, or until another recipe creation strikes! I’ve been so busy lately. Between graduate school, taking an improv comedy class, the holidays, my grandmother dying, etc., I’ve barely had time for cooking. I was able to create two Youtube videos in the beginning of the semester, which you can see here: https://www.youtube.com/channel/UCIGj10TPGenVBNH6vySDPpw! I hope to make more videos on Youtube in the coming year. If you’re not on Instagram or following along here, I’m going to do a quick photo recap of some of the food I made for the holidays. For some homemade gifts, I made my famous sour cream and onion kale chips, green tea, goji, and coconut superfood energy bars (adapted from this recipe), vegan and gluten-free marshmallow wreaths, and chocolate peppermint patties from a recipe that’s basically this (not pictured). We had 4 relatives staying with us from Christmas Eve day until yesterday. My aunt and uncle and cousins have a tradition at their house of making appetizers on Christmas eve. So, I made lentil faux chopped liver dip, a spinach and artichoke dip, and we made mini potato latkes because it was also the first night of Hanukkah and my dad celebrates the holiday and loves having latkes. Instead of using eggs, we used the Neat egg for the first time and it worked out really well! There was also a salad made that I was able to eat. For dessert, I had these gluten-free, vegan sugar cookies I made from a recipe on Minimalist Baker. Check the recipe out here. For Christmas morning breakfast, everyone else was having bagels. My mom was nice enough to go to a local gluten-free bakery and pick up some vegan and gluten free bagels. I topped them with Kite Hill chive cream cheese, my papaya lox, and capers. For my dinner later that day, I made gluten-free, vegan stuffed shells with Kite Hill almond ricotta and pesto. I forgot to take a picture of them. We also had my favorite vegan caesar salad ever, which I also forgot to photograph, but believe there are previous posts on this blog about it. It was a sweet Christmas! I hope you had a very merry one yourselves! As a thank you for reading, here is a picture of my three cats, that my brother photoshopped for a card. However, the best Christmas present is that I have a new recipe! For a soy curl chickun potpie that is soooo good! WordPress has a new feature here, so I’m going to try to see what happens when I upload a word document of the recipe. Soak soy curls, corn, and peas in a bowl with enough warm water to cover. Let sit for at least 10 minutes and drain. Set aside. Steam potatoes and carrots in a steamer basket for 10 minutes. Place olive oil, celery, onions, and garlic in a skillet on medium heat and sauté until soft. Add in the soy curls, corn, peas, nutritional yeast, sage, and ¼ cup broth. Mix in the potatoes and carrots. Stir and heat until the soy curls are warm. To make a gravy for the pie, place the vegan butter and garbanzo flour in a saucepan over medium heat. Whisk until crumbly and beginning to brown. Slowly add in the coconut milk, continuing to whisk. You may need to lower the heat. Add the remaining ¼ cup broth and the bouillon cube. Keep whisking until the bouillon melts and the gravy is thick. You can add salt and pepper to taste once you turn off the heat. Add the gravy into the soy curl and vegetables. Spoon into a bottom of a pie crust. Place the top of the pie crust as you like it. Make slits in the top to allow steam to escape. You may have some leftover filling that you can eat separately or make into other dishes. Bake for 30 minutes or until the crust is golden in color. Enjoy the new year festivities if I don’t post before then (but I do have several posts lined up!) Happy Holidays from Banana Curl, Vegan Girl! 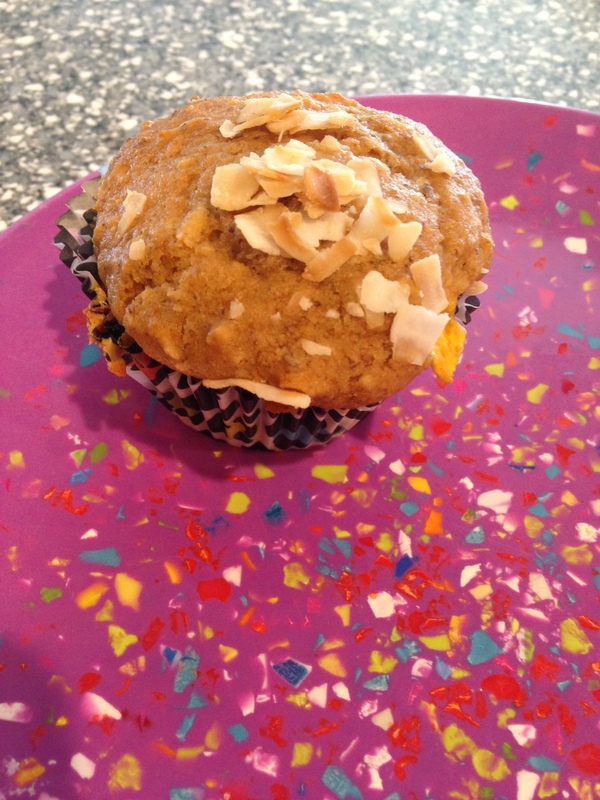 So, I told you I have some healthier recipes coming your way! I had a bunch of champagne mangos (I’ve been very into them lately…can’t get enough) and I wanted to put one into a baked good. I also wanted to bake in some Dang coconut chips as a topping on something and see if they’re just as good in baked items. 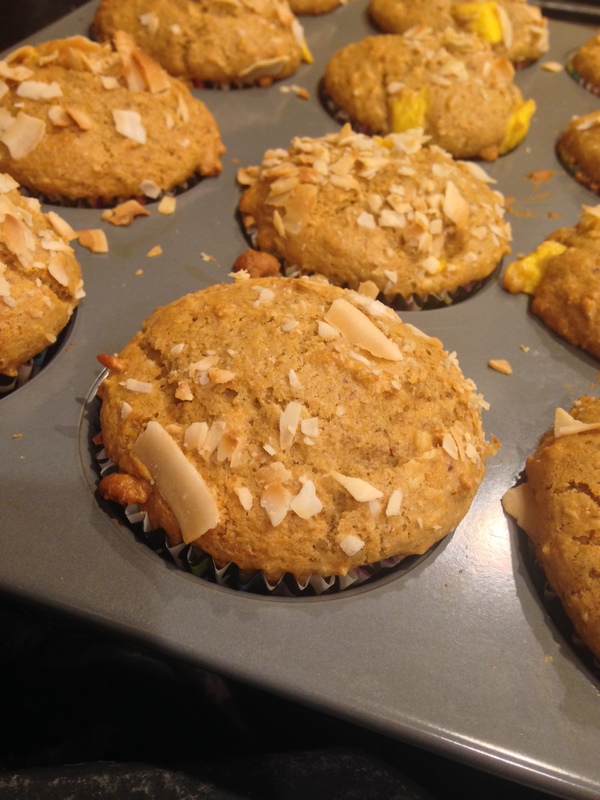 So, that inspired me to make mango coconut muffins. These are made with whole wheat pastry flour and no refined sugars. They’re quite healthy, but also tasty. I served them to my classmates early in the morning and they all loved them. Some knew they were vegan, others didn’t, and everyone said they were really good! In a small bowl, mix flour, baking powder, and baking soda together. In a separate larger mixing bowl, whisk together the flaxmeal and water. Let sit for a bit. Add the agave and coconut sugar to the flaxmeal. Whisk again. Whisk in the coconut oil. Add coconut milk, orange juice, and vanilla. Add the dry ingredients from the small bowl into the wet ingredients. Stir and fold in until just combined. Don’t overmix. Divide batter evenly between 12 muffin tin liners. Sprinkle the crushed coconut chips on top.